It’s been a long few weeks over here at the Napping Household. Mr. Napping has been traveling with work a lot and my days have been full of boys, running errands, meetings, blogging, teaching classes, cooking dinners, working out, trying to get my house under control from the chaos that was summer and just overall craziness. Baby N has started biting – super, right?! – and my brother-in-law dropped in for the weekend with about a day of prior notice. Did you miss the chaos of summer part… Our guest room has been the catch-all and multi-purpose room for the last few months. That all breaks down to my nights being much shorter than I would like them to be. I’m sure some of you out there can relate. I am not the only one with full and crazy days and nights with more time out of bed than I wish. I guess you could say I’ve been a little overwhelmed and stressed. So, by the middle of week 2 on a two-week stretch in the single parent world – kudos to those of you who do this day in and day out, you are superstars! – I wanted nothing more than to binge on an entire bag of OREO’s while my kids were in bed and then some chocolate cake… and maybe just a bit of ice cream. I was looking through a collection of quotes I have on my phone in a Keep note and this one struck me. I will be grateful… I needed to see it. Repeatedly. So, here it is in printable quotation form. Even though the days are long and the nights are anything but, some day, I will miss this. I will miss the giggles and the snuggles, the bedtime stories and the games. I might even miss the toys on the floor… maybe? Maybe not. In any case, I don’t want to wish the days away or miss the special moments that are interspersed with the bickering and messes. I will not miss it. I will recognize it. I will be grateful for the good and not dwell on the less than good. 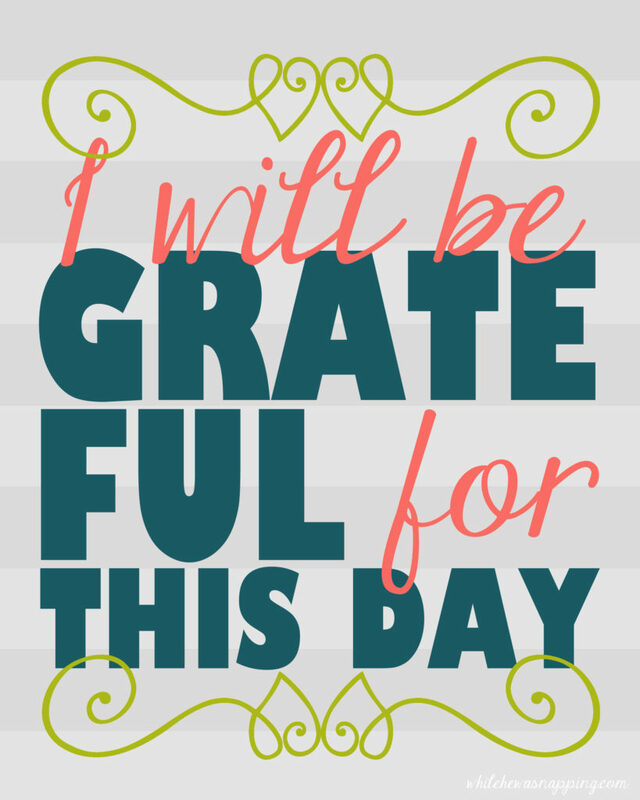 I will be grateful for this day. Not every day is good, but there is good in every day! …And that might have to be my next inspirational printable quote. Click the image to get the download link and print off your own high resolution copy.